Pauline is a legal practitioner with 13 years of significant experience in commercial law practice. 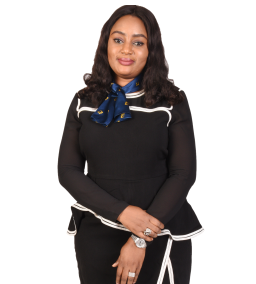 Prior to joining the company, she worked with some of the best law firms in the country including Olaniwun Ajayi LP, Nigeria’s leading law firm proficient in corporate and commercial law, where she got stellar work experience and advised clients on a broad range of corporate and commercial matters. Since joining the Company, she has established a reputation as a widely exposed counsel with multifaceted competencies. She possesses considerable experience in company secretarial practice, compliance and corporate commercial law practice particularly corporate finance, corporate restructuring, mergers and acquisitions and insurance law. A member of the Nigerian Bar Association, she graduated with Honors in Law from Ahmadu Bello University Zaria and the Nigerian Law School.